Measures the official "stimp" (ball roll) speed of any golf putting green. Milled heavy duty aluminum "V" channel construction with ball groove for smooth release. Simply mark a spot on a flat area of the green and place the end of the meter on the mark. Put a golf ball in the hole of the meter and slowly lift the end of the meter causing the ball to roll out. (Approximately 20 degrees). Measure the distance the ball rolls from the mark. Find the average measurement from the different tests. This average number is the stimp meter speed of the putting green. 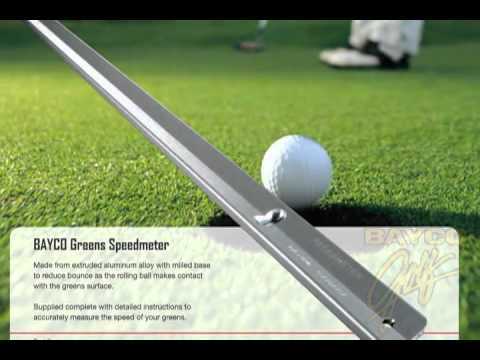 Used by Golf Superintendents around the world to measure green speeds on their courses. Take the stimp meter with you to various golf courses to check the stimp speed of their greens. Learn how to adjust your shots based upon the stimp speed of different greens. This is a fun tool to have as a training aid, but it can really impress your golf buddies with your knowledge of official green speeds. Step 1 Select a level area on the green, approximately 10 feet by 10 feet. (A simple means of checking for a level area is to lay the stimpmeter on the green and place a ball in the V-shaped groove - the movement of the ball will indicate whether or not the area is reasonably level). Step 2 Insert a tee in the green, near the edge of the area selected, to serve as a starting point. Holding the Stimpmeter by the notched end, rest the tapered end on the ground beside the tee, and aim it in the direction you intend to roll the ball. Put the ball in the notch and slowly raise the end until the ball starts to roll down the groove. 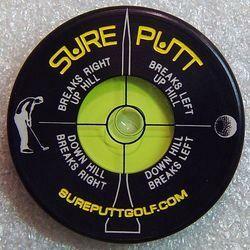 Once the ball starts to roll, Hold the Stimpmeter steady until the ball reaches the putting surface. Repeat the same procedure with two more balls, keeping the tapered end on the same spot. Assuming the balls stop within the prescribed 8- inch limit, insert a second tee in the green at their average stopping point. The distance between the two tees is the length of the first series of rolls. Step 5 Repeat Step 3, thereby establishing the length of the second series of rolls. Step 6 Measure the two distances - for the first series and the second series - and calculate their average. Record this as the speed of the green. Note: Should the difference in length between the first and second series be greater than 18 inches, the accuracy of the resulting average may be questionable. The area selected for the test may not have been sufficiently level - or sufficiently representative of the green - in which case it is advisable to select another area and repeat the test. Sometimes a green may be so severely undulating or sloping that a level area is simply not available (which the data record should indicate). Selecting a reasonably level test area is important. Measurements taken up or down a slope, over mounds, etc., will result in misleading data. Conditions during a test are important. Initially , test your greens under optimum conditions - a cleanly mowed, dry, smooth surface on a calm day. Once this basic speed has been established, you can then document speeds as they vary under unusual conditions: windy days, wet surfaces, non-mowed, recently topdressed , time of day, before and after fertilizer applications, etc. The data thus accumulated will lead to a better understanding of how different management practices affect the speed and consistency of each green on your golf course. Practice makes perfect. A relatively small amount of practice in using the Stimpmeter will increase the accuracy and consistency of your data. Keep thorough records. Obviously, complete and accurate record, maintained over extended periods, are the most useful. The Stimpmeter is an extruded aluminum bar, 36 inches long, with a V-shaped groove extending along its entire length. It has a precisely milled ball-release notch 30" from the tapered end (the end that rests on the ground). The underside of the tapered end is milled away to reduce bounce as a rolling ball makes contact with the green. The V-shaped groove has an included angle of 145 degrees, thereby supporting a golf ball at two points ½" apart. A ball rolling down the groove has a slight overspin, which is thoroughly consistent and has no deleterious effect on the ensuing measurments. The ball-release notch is designed so that a ball will always be released and start to roll when the Stimpmeter is raised to an angle of approximately 20 degrees. This feature ensures that the velocity of the ball will always be the same when it reaches the tapered end. Although the Stimpmeter is sturdily built, it is a precision instrument and should be protected from damage. When not in use, it should be stored in a plastic tube or case. Even relatively slight damage to the release notch or to the groove may cause errors. Once the Stimpmeter is put into use at your course and the resulting information is analyzed and acted upon, the possibilities for improved playing conditions are virtually endless. Green speeds for individual golf courses should remain up to the course officials, with the input of the superintendent, of each facility. 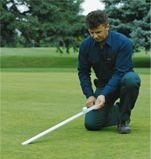 Stimpmeter Readings on American golf courses generally range from 7 feet to 12 feet, depending on many factors (e.g. Slope, Contours, Green Size, Grasses, Weather, Budgets etc.). Experience shows that trying to keep the speed above 10 feet on a consistent basis usually causes difficult-to-manage turf problems and is not recommended. Mowing height and frequency of cut are extremely important considerations. The mower's bench setting is no guarantee that greens are cut at a prescribed height. More over the condition of the mowers; the type of mowers (floating or rigid cutting units); attachments such as Wiehle rollers, groomers, brushes, and combs; all can make a difference in the cut and green speed. So does double-cutting, verticutting and rolling. The precise effect of each of these factors can be measured with the Stimpmeter. Watering practices and surface moisture (dew) are crucial to green speeds. Moist turf will be slower than dry turf at any mowing height. Fertilizing practices can be studied, such as the effects of rate and frequency of application, nitrogen source, and nutrient balance. Grain is sometimes a deterrent to uniformity of speed. How grain is affected by changes in direction of cut, use of vertical mowing equipment, riding versus single unit mowers, etc., can be studied a they relate to green speed. The effects of aeration, spiking, and topdressing can be measured, both before and after treatments. Speed variations among the different grasses presently used for putting greens can be documented. By keeping good records, you will be better able to observe, determine, and explain variances in green speed throughout the year and compensate for them. For example, in spring, when Poa annua produces excessive seedheads, greens can be slower and more bumpy. Your records will serve as a reminder to topdress, begin vertical mowing, or schedule other practices calculated to help maintain the desired speed and consistency. Knowing the speed of the greens may assist in determining whether a hole location is fair or unfair. A green so fast (or a hole cut in such a position) that a ball cannot be stopped near the hole from any point on the green, for example, is an unfair challenge. Championship greens should be fast and uniformly paced, firm but resilient. They should place a premium on well-executed shots, while exacting a penalty for less precise shots. Close daily mowing, a light nutrient program, proper irrigation scheduling, a good topdressing schedule, and a minimum of thatch are the accepted means of achieving excellent greens. The test for determining whether a surface is properly firm but resilient is the type of ball mark that results from a distance shot onto the green. If the turf within the ball-mark depression holds together, the green has the firmness required of a championship green. Strive for championship conditions only for limited periods of time, principally for important club events. Turfgrass failure is common when championship conditions are maintained for too long or when adverse weather conditions occur. From Anonymous of Detroit, Michigan on 7/16/2018 . From Bill Stanisci of oxford, Michigan on 4/3/2018 . From Marc of Tampa, Florida on 5/11/2016 . From Anonymous of Toronto, Ontario on 1/19/2015 . From Harry of Männedorf, Switzerland on 3/6/2013 . 10/19/2012 – Is a stimpmeter a handheld device? (As opposed to a static device with a standard sloping angle that will produce more accurate . . .
12/13/2009 – Do you know what the stimp speed is for a average amature Colorado course? 7/15/2009 – What makes this an "official" Stimpmeter? How does it differ from what the USGA uses? Is it the exact same one that the . . .